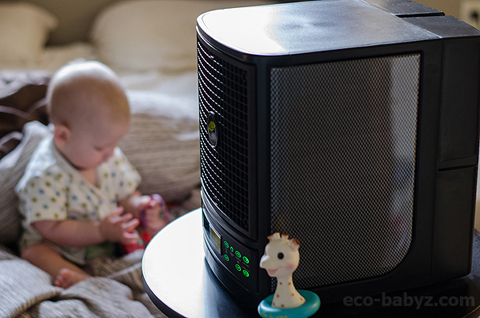 Eco-Babyz: GreenTech GT3000 Air Purifier Review, Discount, and GT50 Giveaway! GreenTech GT3000 Air Purifier Review, Discount, and GT50 Giveaway! We take great care in picking products for review on Eco-Babyz. 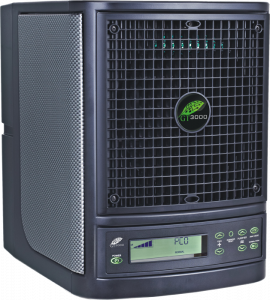 Sometimes something comes our way that really blows our socks off and the GreenTech Environmental GT3000 Air Purifier is one of those products. It's also something I was very skeptical about. I wasn't sure it was quite the right air purifier for us and our home, or that it even worked since I couldn't find many reviews. I had it in my Amazon cart, ready to order, then my fabulous husband suggested I contact the company since it perfectly fits our mission at Eco-Babyz - helping you create a healthy home and healthy family! 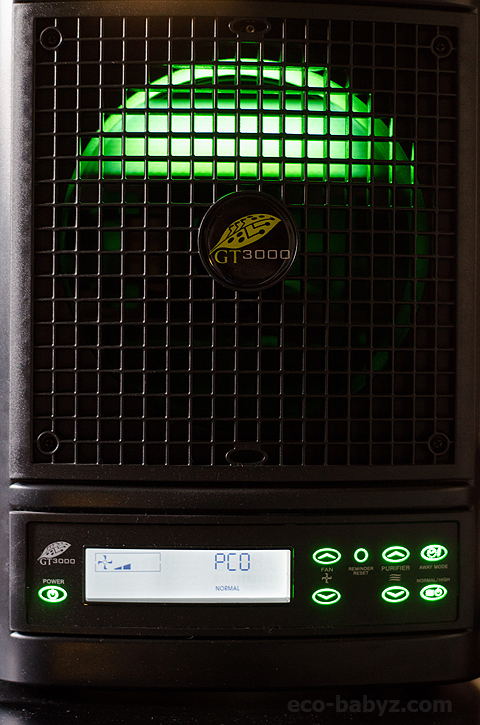 I'm very thankful to GreenTech Environmental for providing the GT3000 for review. So what's so great about it? How is it different from your average HEPA air purifier? Well, it uses catalytic oxidation technology, high levels of negative ionization, and electrostatic filtration. It creates safe levels of ozone adjusted to the square footage of the space. This technology doesn't just filter particles like most air purifiers, it eliminates pollution! Odors, smoke, bacteria, dust, pollen, viruses, pet dander, etc. Even chemicals in your furniture, walls, carpets - if you know what we're about at Eco-Babyz, you know that's something to be pretty excited about! Here I was telling you there isn't really much you can do about some indoor pollution contributors, like furniture. Now there is something you can do. I don't want to sound like a sales person, but this machine is incredible, it's didn't just change our indoor air - it changed our quality of life and how we feel! You may have heard negative things about ozone, but I can assure you there is nothing bad about the amount that this machine creates. You know how your home smells fresh when you open the windows and let the air flow through the house? That's what the GT3000 does for your home, it makes the air like outdoor air, which always has ozone. Unfortunately the misinformation campaign on purifiers that create ozone really twists the facts. You would have to put it on the highest setting in a tiny closet or bathroom for it to create levels of ozone that would be temporarily unsafe. I always prefer fresh air, but if it is chilly winter outside or 90 degrees in the hot summer, I don't always have a chance to open the window. Not to mention all the pollen that flies in with windows open. As I have mentioned before, and I'll say it again - indoor air is on average 5 times more polluted than outdoor air. Even more so if you use toxic cleaners, chemical air fresheners, and petroleum candles. We live in an old home, and the moment the window is closed - all you smell is the old carpet, wood, and mustiness. This powerful machine has changed all that. We have had many health issues living here. 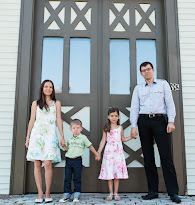 Headaches and allergies were the most common, it was tough to get a good night's sleep, especially for my husband. We placed the GT3000 air purifier in our bedroom to see if it would alleviate our symptoms. On the second night and subsequent nights we woke up feeling refreshed and amazingly my husband hasn't complained about headaches since then (until we recently moved it out of our room)! You know what I felt like with it in our room? Sort of like the way you feel when you sleep outdoors in a tent while camping. I recall a day when I was pregnant and very tired, we decided to go to a park by the river and I didn't feel like I was up for it. I went anyway and I remember that after ten minutes of being in fresh air I felt terrific and had so much energy. This is how the GT3000 makes me feel whenever I am in the room where we use it. Pretty incredible, beats caffeine! Our newly remodeled attic/office proved to be a problem as well. There are no windows there, hence no fresh air! It became a place I tried to avoid because of so much dust and not feeling well when up there. We put the GT3000 there and it really changed the space, it no longer smells or feels like an attic. This is where I work every day and it is important for us to have clean, breathable air there for our kids and I.
Cloth diapering mamas? The GT3000 gets rid of any smells near your pail, changing area, or laundry storage! We've had stink issues with our diapers, we were trying to find a wash routine to get that out. Meanwhile they didn't smell very fresh when I line dry them on a rack indoors. This totally eliminated the smell. It's very light and easy to move around, so every few days I put it where I need fresh air. Sometimes I leave it in one spot for a week or two - like our bedroom. I was also really excited to learn about the pureWash Eco-Friendly Laundry System, hopefully, maybe we'll get to try it and we'll tell you all about it. That would pretty much revolutionize laundry! Maybe you love to cook but you're not crazy about the cooking smells around your house after say making fish, or cauliflower, cabbage, etc. The GT3000 is amazing at getting rid of cooking smells! I baked cookies the other day, my husband came home in the evening after work and was baffled. Usually he comes in the door and he can smell cookies all over the house, so he goes into the kitchen to grab a few. This time he came home, didn't smell anything, but saw the freshly baked cookies in the kitchen, that confused him! So if you want your house smelling like cookies, you turn it off, and if you don't want it to smell like fish or ethnic cuisine - you keep it on! I imagine if you have pets, the GT3000 would be a great solution to your pet odor problems. It really gets rid of all annoying smells we've run into. They also make plug-in purifiers that are great for bathrooms and small spaces (one of you will win one!). GreenTech products are used in the medical field and in the food service industry. The units are perfect for your doctor's office, restaurants, children's museums, the spa, you name it. But best of all, it's perfect for any home - your home. If I could, I would give each one of you a GreenTech Air Purifier! If you are interested in how exactly the GT3000 technology works, watch this great video that explains in detail why and how it cleans your air. The unit is very easy to use and has quiet operation. I like it in the bedroom because it does create a little bit of white noise (on normal mode, low fan) that actually keeps our baby from waking. I love that you can adjust the settings on this unit and it can clean the air in a space up to 3000 square feet. It is fairly easy to clean, the electrostatic filter is washable and can be used over and over again. The GT3000 retails for $799, but we've got a special deal set up just for our readers on a special shopping page. You can buy the GT3000 today with our exclusive coupon code 'Eco-Babyz' for $649 - the lowest price available to the public! Since we like being upfront with you, we will make a little commission through your purchase, your support is appreciated! Connect with GreenTech on Facebook and Twitter! It's a great Father's Day present for a health conscious dad! One of you will win the GreenTech GT50 Plug-In Air Purifier! We have 4 cats and 4 dogs, we would love one of these to help with all of the pet dander not only for us, but for our daughter. It creates safe levels of ozone. I love that you can wash the filter (no additional costs with it). With allergies so prevelent in our family this would be a great product to have. I didn't realize a product could create safe levels of ozone in our home... I didn't even know to worry about ozone levels! Its amazing what technology can do! My husband has sleep problems, so maybe it would help my husband sleep better, too. I would love to get rid of the smell coming from my cloth diaper pail. I like that it can help get rid of pet odors. With 3 dogs, that can be an issue around here! I like that it can rid your house of pet odors. I have house cats, so sometimes it can be a problem. I like that it can treat pet odors! We currently own the GT3000 & love it. It makes such a difference in the smell of our house that I can tell if it has been shut off for a period of time. I cloth diaper as well & if I am drying the dipes on a rack in the house I always put it next to the purifier. Our favorite feature is how easy it is to clean the filter when needed. It comes apart easily & washes right up. I love that the filter is washable.. that is a must in my house! I love that it eliminates pollution. I have 4 cats, a dog and 4 smelly kids lol, this would be awesome! I like that it gets rid of smells when cooking and especially pet odors! I love that it's a great solution to your odor problems (any) I have a pet hedgehog this would be perfect for her area, which is right near our living room. I've suffered from really bad sinus headaches for years. The GT3000 air purifier would be a blessing. I love that it makes the air smell fresh! Comes in handy with a doggie in the house! Trish Jarrett It helps w/allergies!! To get rid of pet odor. I get a LOT of headaches, and I'm hopeful that I could have the same luck that your husband had! 4 cats, 2 dogs and a smoker in the house...Need some fresh air to help my allergies! Thanks for the opportunity to win this machine. I like that it gets rid of the dirt in the air and how it helped your husband with his headache. That it helps with pet odors. I have breathing problems and our indoor pets and their dander do not help. I like it for helping with pet orders. My parent's house smells so bad sometimes. This would be for them. I love how fast it works! I love that the filter is washable. I hate having to buy replacement filters. The idea of my husband, son, and I rolling out of bed in the morning with nary a sneeze or sniffle...quite tantalizing. I love that it gets rid of any smells, fast! My favorite feature is that is get rids of pet odors! I like that it helps with allergies at night since that is one of my biggest problems I deal with on a daily basis. For some reason whenever my neighbor cooks something stinky like cabbage or fish, I can smell it in my apartment. I have talked to our sup about it and he has checked all my vents and all areas and there are no openings but I still smell it. So this would be a great thing for me to have because I don't like cooked cabbage and the smell makes me sick. I like that it helps alleviate allergy symptoms. I like how it can remove any scent in the air. i love it for the pet dander! I like the washable filter and that it removes pet smells and mold threats! I love that it helps get rid of toxins! Great giveaway. We also live in an older home. Love what you said about your attic!! It reduces asthma attacks and colds. was amazed at how it took the smells out of your home. my granddaughter has lung problems and i'm not a great duster so this would be perfect for her room. Definitely being allergy free! My son has many allergies so this would help a lot. I also love that you can clean the filter... that makes things easy and cheaper. thanks for this great giveaway! That it helps get rid of pet odor, that is needed around here. Love how small it is, love the washable filters! It gets rid of pet odor! Thats a biggie for me! My favorite feature is that the filters are washable, and that it works quietly! It gets rid of smells and pet odors. I have 2 cats so this would be helpful. I love that the filter is washable. the fact thats it compact and meant for small rooms. i like the very easy to use and has quiet operation. I like that it can get rid of pet odors - perfect for near the litter box! I like the looks of it as well as the easy of use. I like that the air smells good. I like that it's light and easy to move around ...with 3 (especially the 2 boys) kids in my home each room has it's own odor problems and it would be nice to move it around easily. It gets rid of smells, not just freshening the air from allergens. It gets rid of cooking smells. Needed feature! I like that the filter is reusable. I hate having to invest a lot of money up front only to find out that I have to keep investing money to keep it working. This would be great to have! Hope I win! The fact that it helped alleviate your allergies and headaches is amazing to me as I struggle with this daily! We have 2 cats, an old house and allergies. This could help with all of that! I like that it would help with allergies and right now we have a lot of smoke from the fires here in New Mexico. Also, trash and litter box odors drive me up the wall! My husband has asthma and terrible allergies, so this would be great to try! I like the white noise and its easy to clean, the electrostatic filter is washable and can be used over and over again. I like that it filters out chemicals from furniture and carpets. I also like that it eliminates pet smells. We work with a local dog rescue and take in foster dogs. Sometimes we have up to 4 dogs total (including our two). We need help with pet smells! I was happy to hear you address the issue of ozone being unsafe. I have heard murmuring so it was nice to hear that it is safe. creates safe levels of ozone. My little girl Roxy has Asthma, and is very sensitive to smells, this would be perfect for her, as she has two big smelly brothers lol and a smelly baby sister! She would definitely appreciate the odour control! I like that it helps eliminate odors! That it gets rid of pet odors and plugs in I could put it right near where my 2 dogs sleep! I love that the filter is so easy to wash! I like that it's light and easy to move around. It's very convenient to be able to easily put it where you need it. pets, the GT3000 would be a great solution to your pet odor problems. I like that it's good at getting rid of odors and is quiet. you can wash the filter?! heck yes! That's my kind of purifier! My favorite feature is the washable filter! I like that it uses catalytic oxidation technology. I love that this helps so much with allergies, we need that! I love that it helps rid people of headaches and keeps rooms from overwhelming odors building up. i loved the video you did! this would be so wonderful in our dusty, cat-filled home. im sure it would help with my allergies too! I like that you can wash and reuse the filter. I think this would be great for me because I have really bad allergies and asthma. Up to 3000 square feet? Amazing!!! My favorite feature is that it can help eliminate odors. I have three dogs that I love but I do not love the odors that come with owning them. It uses adjustable purification and gets rid of a range of odors/etc. Love the design & plug in nature! I like that it's small and nice to look at. I love that it gets rid of odors of all kinds. Your review is what made me realize having one of these would really help me sleep better.Thanks for the awesome giveaway! Getting rid of odors and minimizing dust particles would be most helpful for us. It works up to 3000 feet! Incredible! The thing that stood out to me most is when you said your husband's headaches reoccurred after you removed the system out of your bedroom. I have headaches a lot also, and I really wonder if this would help. get rid of pet odors. It gets rid of cloth diaper smells!!!! I like the idea of controlling pet odors. I like that "it can clean the air in a space up to 3000 square feet"
That it is quiet and deals with pet odors! I like that it got rid of pet odors. I am impressed that this small a machine can clean the air in a space up to 3000 square feet. It would be wonderful to use it in my home and I would love to win it. pet odor problems. we have those. lots of those. Mmmmm. The possibility of being rid of pet odor is...enticing. i love the fact that it gets rid of cooking smells. I like that it eliminates odors. I would love to see if it helps with smoke odors. It gets rid of Allergents! I like that it gets rid of cooking smells. That it helps with kitchen smells. What stood out most to me is that it had a washable filter. I thought this was pretty awesome: "It creates safe levels of ozone adjusted to the square footage of the space. This technology doesn't just filter particles like most air purifiers, it eliminates pollution!" I like that you can wash and reuse the filter, so you never have to buy replacements. It gets rid of smells while cooking. I like how it helps with pet odor problems. I always feel like my house smells of cat since she sheds like crazy! That it can eliminate pet odors. That would be a huge bonus! I have asthma and we both have seasonal allegies AND two furry kitty cats. It would be a godsend to have a machine like this that purifies the air, eliminates order and allergens! And Washable filters are like the frosting on the cake! pet odors are a major issue in my household. no more diaper smells!!! The washable filter is great. What stands out is it has catalytic oxidation technology, high levels of negative ionization, and electrostatic filtration. I like that the filter is washable. I am very interested in the idea of it removing pet odors. I love my cats, but cannot deny that at times the odor does appear! I like that is emits on soft white noise. Thanks! It can get rid of pet odors! The part of the review that stood out most was the picture of the baby next to the purifier (great idea), but the idea of no cooking smells was a big stand out too. My favorite feature is the washable filter. I like that it helps remove pet odors. I like that it gets rid of pet odors. It stood out that your "old house" smells were completely eliminated. I like that it get icky cooking smells like fish out of the air. I like that it eliminates odors and has a washable filter. That it can rid your home of pet odors and dander. I love how efficent it is at removing odors. We have a very adventurous dog and cat in a NYC apartment, which limits how far I can safely open the windows (mere screens will not stop these clever boys). I'd love some fresh air! I love that it gets rid of smells! I like that it get's rid of pet odor. I have a cat, so this would be great! The electrostatic filter is washable. They use them in the food and medical fields. Interesting.